← The Relationship Between Longitude, Latitude and the Nautical Mile. If a ship were to steer a steady course, that is one on which her heading remains constant, her track would cut all meridians at the same angle, as the following diagram shows. Such a line on the Earth’s surface is called a rhumb line. When the rhumb line cuts all meridians at 90o, it will coincide with either a parallel of latitude or with the Equator. When the angle is 0o, the rhumb line will be along a meridian of longitude. A vessel’s course will always be a rhumb line; thus the course to be steered to travel from one place to another will refer to the angle between the rhumb line joining the places and any meridian. Calculating the distance between two points along a rhumb line. 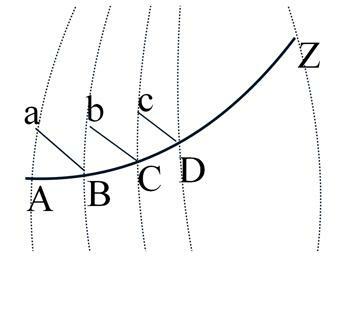 In the next diagram, A, B, C, D and Z are meridians of longitude; the lines aB, bC, and cD are different parallels of latitude; and the line ABCDZ is a rhumb line. A series of right-angled triangles have been constructed along the rhumb line AZ and in each triangle, one short side lies along a meridian of longitude, one lies along a parallel of latitude and the hypotenuse lies along the rhumb line. Middle Latitude. If we were to calculate the departure along each of the parallels of latitude aB, bC, cD, in the diagram above, we would find that they would not be equal and so the task of calculating the total departure would be complicated. In practice, the total departure is taken to be the east-west distance along the intermediate of these parallels which is known as the ‘middle latitude’. Departure = d.long cos(middle latitude). Mean Latitude. In most cases, the arithmetic mean of the two latitudes can be used as the middle latitude without appreciable error, so the approximate formula dep.= d.long cos(mean lat) may be used. Dep. = d.long cos(mid lat). Suppose a ship sails from position 50oN, 32oE., to 70oN., 15oE. The d.long is 17o and the mean latitude is 60o. = 510’ or 510 n.m. In the tables for converting mean latitude to middle latitude, the correction for a mean latitude of 60o and a difference of latitude of 20o is +1o 09’. So the middle latitude = 61o.15. By comparing these results, we can see that there is a significant difference between calculations involving the mean latitude on one hand and the middle latitude on the other. Ddist = Dlong x Cos Lat. Dlong = Ddist ÷ Cos Lat. = Ddist x Sec Lat. dep.= d.long cos(mean lat) (for distances 600 n.m. or less). Dep. = d.long cos(mid lat). (for distances over 600 n.m.). The rhumb line AZ is divided into a large number of equal parts AB, BC, CD, DZ. 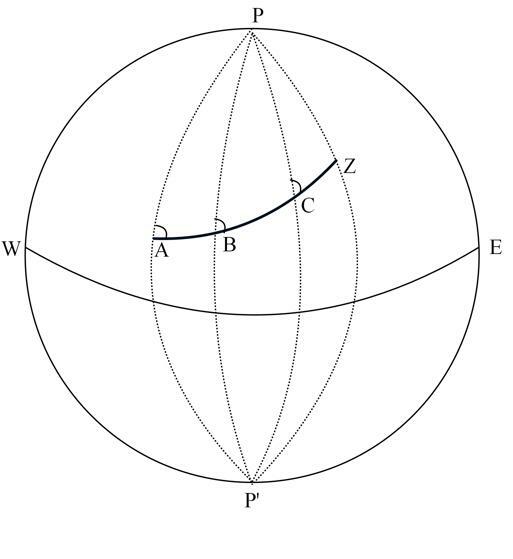 aB, bC, cD… are arcs of parallels of latitude drawn through B, C, D…..
Pa’, Pb’, Pc’… are meridians of longitude. Therefore, the angles at a, b, c….. are right angles. If the divisions of AZ are made sufficiently small, the triangles ABa, BCb, CDc….. will be small enough to be treated as plane triangles instead of spherical triangles. Since the course angle is constant by the definition of a rhumb line, these small triangles are equal. 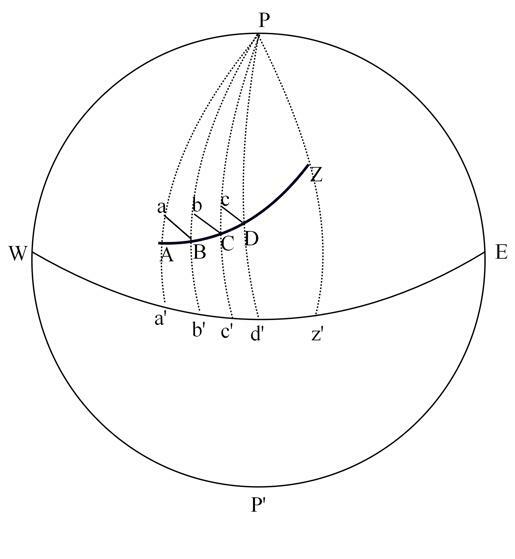 AB is the distance made good, aB is the departure along a parallel of latitude, angle aAB is the course angle. Therefore, Sin(course angle) = departure ÷ dist. This formula applies to all of the small triangles since they are equal. The departure between A and Z therefore, is the sum of the departures of all of the small triangles. We have established formulae to calculate Dep and D.Lat; we now need a formula to find the course. If we return to triangle ABa, we can see that the course angle can be found by the formula: tan(course) = Dep ÷ D.Lat. Example. At 0900 GMT, a life raft is reported to be in position 30o 56’.4 S, 0o 25’.6 E. A rescue ship reports that its ETA at the vicinity is 2130 GMT. The rescue ship’s navigator calculates that wind and ocean currents will cause the life raft to drift in direction 345o at 3 knots. Calculate the expected position of the life raft when the rescue ship is due to arrive. New Lat = 30o 20’.2S. DLong. = 9.7 Sec(30.64) = 11’.27W. A fuller explanation of rhumb line sailing together with the derivation of the formulas given above can be found in the book ‘Astro Navigation Demystified’. This entry was posted in astro navigation, navigation and tagged astro navigation, celestial navigation, mathematics of astro navigation, navigation, rhumb line. Bookmark the permalink.